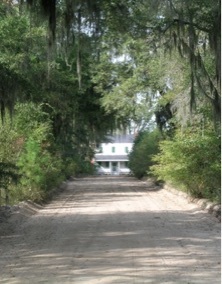 Sylvan Grove Plantation - Today a hospital is located on part of this former plantation which 17th Corps commander Union Major General Francis P. Blair, Jr. used as his overnight headquarters on November 17, 1864. Its owners fled and endured a harrowing experience. Butts County Courthouse - On November 17, 1864 the county seat of Jackson was headquarters for the Federal “Right Wing” (15th & 17th Corps) led by Union Major General Oliver O. Howard. Numerous acts of destruction were countered by several selfless deeds. Hillsboro - Birthplace of U.S. and later Confederate senator Benjamin H. Hill, it was headquarters for the Federal 15th Corps the night of November 19, 1864, including for “Right Wing” commander, General Howard. The entire Right Wing passed through Hillsboro between November 19th and 21st. 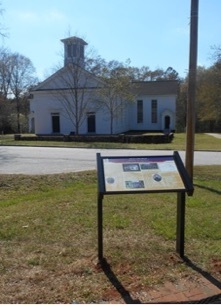 Battle of Sunshine Church - On July 31, 1864 as Federal cavalry under Major General George Stoneman were returning north from a raid (during the Atlanta Campaign) they were defeated here by Confederate Brigadier General Alfred Iverson's cavalry. The Federal 15th Corps subsequently burned the original church the next November during their March to the Sea. Old Clinton - Clinton became a manufacturing center and was once Georgia’s fourth largest town. After the railroad bypassed Clinton it evolved into a peaceful village with many antebellum homes. In July and November 1864 a total of about 22,000 Federal troops were in the area. Macon City Hall - Built in 1837, City Hall was used as a Civil War hospital, then as Georgia's temporary capitol building during and after the March to the Sea. 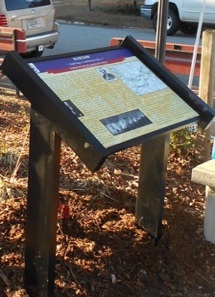 It was also a Confederate surrender site on April 20, 1865. The Town of Griswoldville - Samuel Griswold made cotton gins, operated a saw mill and other facilities here before the war. During the war he manufactured Navy revolvers and other munitions for the Confederacy. The town was destroyed by Federals in November 1864 and was never rebuilt. 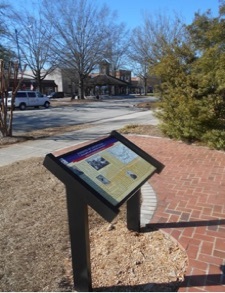 Gordon - Founded in 1843 with the first Central of Georgia train service, much of the original town was destroyed in July 1864 by Stoneman's raiders followed by portions of Union Major General Oliver O. Howard's 28,000-man “Right Wing” between November 22 and 25, 1864. Ball’s Ferry - After two skirmishes here on November 24 & 25, 1864, the Federal “Right Wing” forced a small Confederate force to retreat. 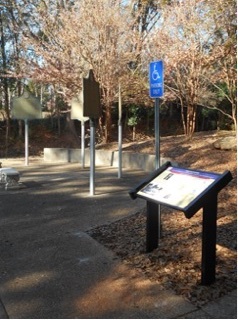 This enabled two pontoons bridges to be constructed allowing the entire 15th & 17th Corps to cross the Oconee River on the 26th. New Hope Methodist Church - Founded in the late 1700s, this historic church was damaged but survived being occupied and surrounded by the camps of the Federal 17th Corps, accompanied by General Sherman, during the night of November 28, 1864. Tarver's Mill - General Sherman and the Federal 17th Corps stopped at this mill on November 29, 1864, which was made famous by a drawing that subsequently appeared in Harper's Weekly magazine. Bartow (Speir’s Turnout) - The town was renamed for Confederate Colonel Francis Bartow, killed at the First Battle of Manassas. Part of the 20th Corps destroyed the railroad here on November 28, 1864. The following day General Sherman rode just south of town with the 17th Corps on the (Old) Savannah Road. Old Savannah Road - The Federal 17th Corps, accompanied by General Sherman, camped along this historic road on November 29, 1864. The following day they continued marching east through the “Pine Barrens” and “Wiregrass” region of central Georgia. 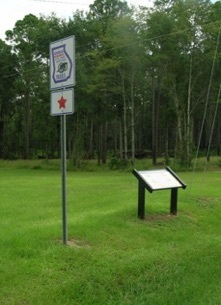 Pine Barren and Wiregrass - the Federal 17th Corps turned north here to cross the Ogeechee River. Two 15th Corps divisions followed from the south, turning east on the Savannah Road. In all, some 20,000 men passed through this crossroads. 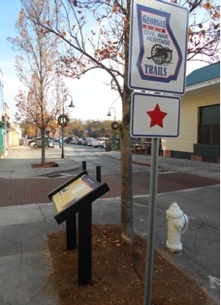 Millen Junction - An important railroad hub linking Savannah, Macon and Augusta, this town was entered by the more than 11,000 soldiers of the 17th Corps on December 2 & 3, 1864. 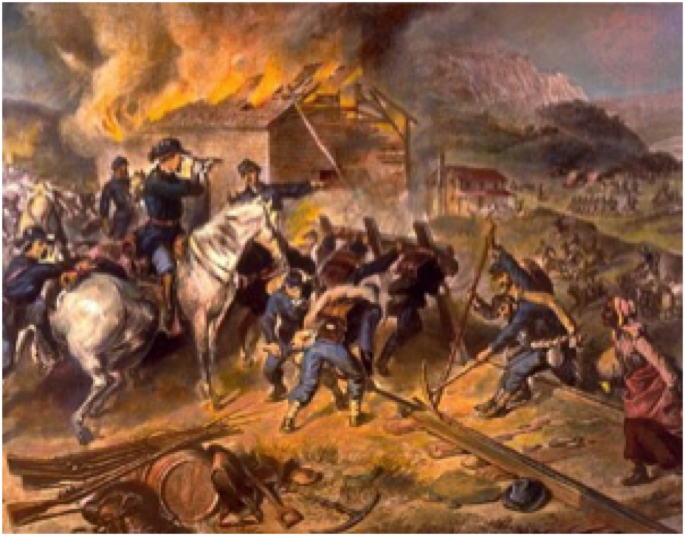 The Federals burned the impressive depot, hotel and warehouses then turned south to continue their march. 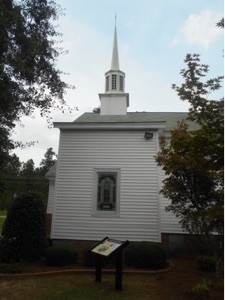 Little Ogeechee Church (Oliver) - 4,000 Confederates led by Major General Lafayette McLaws entrenched here to block the Federal 17th Corps from crossing Little Ogeechee Creek. They were forced to retreat on December 4, 1864 when outflanked. Guyton General Hospital - This Confederate hospital was opened in 1862, expanding to 270 beds with a staff of 67 before closing upon the approach of Federal troops in December 1864. Elevated Tent Camps - The Federal 17th Corps arrived in this low-lying area on December 9, 1864, requiring many small mounds to be built before making camp. About 1/2 mile to the east on the railroad was a Confederate heavy artillery battery. 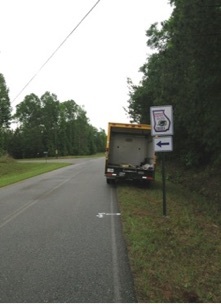 One of its shots narrowly missed General Sherman. Savannah & Ogeechee Canal - On December 8, 1864, Union Brigadier General John M. Corse’s division of the 15th Corps moved down the east side of the Ogeechee River to the canal, drove away a tiny Confederate force, rebuilt a burned bridge and camped before continuing toward Savannah. Ways Station - Now known as the City of Richmond Hill, this area was originally named Ways Station #1-1/2 when established in 1856. 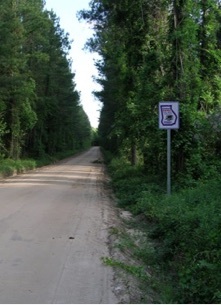 An important transportation juncture to Fort McAllister and south Georgia, the railroad through this area was destroyed by Federal troops by mid-December 1864. 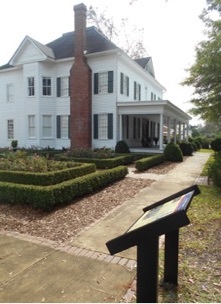 Cherry Hill Plantation - This thriving rice plantation was substantially destroyed by Federal troops in mid-December 1864 on their way to capture Fort McAllister. The Richmond Hill Historical Society Museum is now located on the property in a structure originally built by automotive giant Henry Ford. Stone Mountain Cemetery - Over 200 Confederate veterans are buried here. The nearby massive monolith “Stone Mountain” was admired by the 27,000+ Federal soldiers in the “Left Wing” of Major General William T. Sherman’s army as they marched east from Atlanta on November 15 & 16, 1864. Conyers Station - The current depot succeeded one burned by Union Brigadier General Kenner Garrard’s cavalry on July 22, 1864. Then on November 17, 1864, the Federal 14th Corps was accompanied by Major General William T. Sherman as it marched through Conyers destroying rails. Old Church (in Oxford) - Built in 1841 as a Methodist meeting house, Old Church was used as a war-time hospital. 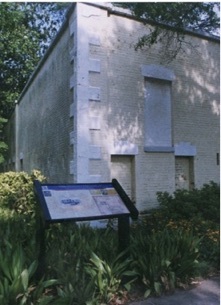 The church is adjacent to the slave quarters “Kitty’s Cottage,” with Old Emory College (Oxford College) located nearby. Federal troops were in Oxford multiple times during 1864. 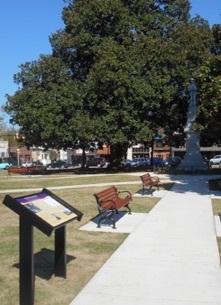 Covington Square - Some 14,500 Federal soldiers of the 14th Corps, commanded by Brigadier General Jefferson C. Davis, passed through Covington on November 18, 1864. They entered with bands playing, doing comparatively little damage following two cavalry raids the previous July. Hightower Trail (Philadelphia Church) - Philadelphia Church was a reference point on Civil War military maps along this famous Native American trading route. Approximately 14,000 men of the Federal 20th Corps marched past this landmark along the Hightower Trail on November 17, 1864. Centreville (Jersey) - Known as Centreville in 1864, Brigadier General Alpheus Williams’ 20th Corps camped in and near this community the night of November 17-18, 1864, foraging liberally. The following day the Federals continued marching generally east on Hightower Trail toward Social Circle. Social Circle - The Federal 20th Corps marched through Social Circle along the Hightower Trail on November 18, 1864, destroying railroad tracks. The town’s depot and warehouses had been burned on July 23, 1864, during Union Brigadier General Kenner Garrard’s cavalry raid. Shady Dale - This plantation community was heavily foraged on November 20, 1864 by the Federal 14th Corps, accompanied by General Sherman, while also liberating hundreds of jubilant slaves. 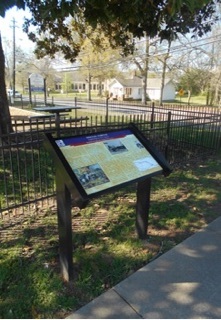 Rutledge Station - The Federal 20th Corps, accompanied by “Left Wing” commander Major General Henry W. Slocum, arrived here on November 18, 1864. They destroyed the railroad and warehouses before camping that night east of town en route to Madison. Madison Station - The Federal 20th Corps arrived in Madison on November 19, 1864, destroying the railroad, depot and warehouses. Most homes were undamaged and today they represent much of Madison’s beauty and culture. Blue Springs (Swords) - Union Brigadier General John W. Geary’s division of the 20th Corps marched east from Madison on November 19, 1864. It burned an important railroad bridge over the Oconee River and destroyed other properties before turning south the following day. Old Governor’s Mansion Completed in 1839 - The mansion was occupied by eight governors, including Joseph E. Brown, until the state capital was moved to Atlanta in 1868. It served as headquarters for General Sherman on November 23 & 24, 1864, and is now an impressive museum. Penitentiary Square - Burned by prisoners after many had been paroled to serve in the Confederate militia, and just prior to the arrival of nearly 29,000 soldiers in the Federal army’s “Left Wing” on November 22 & 23, 1864. 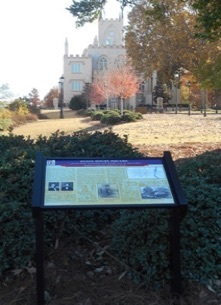 This 20 acre campus is now home to Georgia College & State University. State House Square - Georgia’s capitol grounds from 1807 to 1868, and now home to Georgia Military College, were damaged from the explosion of the State Magazine in November 1864. The impressive gothic styled former Capitol building has been restored and now houses a museum. Washington County Courthouse - As the Federal Left Wing entered Sandersville on November 26, 1864, they were fired on from inside the courthouse by some of Confederate Major General Joseph Wheeler’s dismounted cavalrymen. The following day General Sherman ordered the courthouse burned. 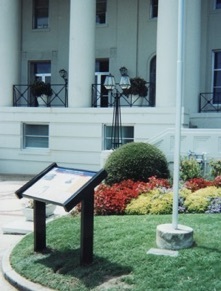 It was replaced after the war by the current building. The Brown House - Purchased in 1851 by the William Gainer Brown family, this house was used by General Sherman as his headquarters on the night of November 26-27, 1864. The house has been restored and is now operated as a museum by the Washington County Historical Society. 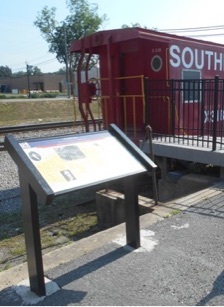 Tennille Station - General Sherman and his staff arrived in Tennille on November 27, 1864 to join his army's “Right Wing” for the remainder of their March to the Sea. Sherman witnessed the destruction of the town's railroad and warehouses. The present depot was built shortly after the War. Ogeechee Crossing - Two divisions of the Federal 20th Corps escorting the Left Wing’s 1,200 wagons crossed the Ogeechee River here on November 28 & 29, 1864. Confederate cavalry and marshy ground continuously slowed their progress. Sacking of Louisville - When the majority of the “Left Wing” halted to rebuild bridges across the Ogeechee River just west of Louisville a number of soldiers improvised a crossing. They entered town with few officers, looting and burning much of the town until the main army arrived to stop them. The Augusta Arsenal - Now the campus of Augusta State University, its administration buildings are the original United States Arsenal structures, founded on this site in 1826. Seized by Georgia militia in January 1861, it became a major Confederate manufacturing center until the war's end. Confederate States Powder Works Chimney - This 153 foot tall chimney remains from the largest facility ever built by the Confederacy. Colonel George Washington Rains oversaw construction of multiple brick buildings, then production of some 3 million pounds of quality gun powder. Ivanhoe Plantation - Originating from a 1765 Crown Grant by King George III, a sharp skirmish occurred here on November 27, 1864 between the cavalrymen of Union Brigadier General H. Judson Kilpatrick and Confederate Major General Joseph Wheeler. Afterward the latter camped nearby. The Roberts House - This antebellum cottage, now the Burke County Museum, “witnessed” two cavalry clashes through the streets of Waynesboro on November 27 and December 4, 1864, respectively. The second battle ended with the burning of bridges over Brier Creek toward Augusta. Big Buckhead Church - Built it 1855, this historic church witnessed the largest all-cavalry battle during the March to the Sea, involving more than 6,000 troopers, on November 28, 1864. Jacksonborough - The Screven County seat until 1847, the town was cursed and today only the 1815 Dell-Goodall House survives. Federal cavalry and most of the 14th Corps camped in this once prosperous community on December 5, 1864. Ebenezer Creek - On December 9, 1864, after the Federal 14th Corps crossed on a pontoon bridge, its commander ordered the bridge removed before recently emancipated slaves could follow. Some troops tried to help, but a number of slaves drowned trying to swim to freedom. Savannah River Plantations - This rice-growing area along the Savannah River was occupied by Federal troops in December 1864. Two rifle & artillery duels with small Confederate gunboats ensued. After Union Major General William T. Sherman captured Atlanta on September 2, 1864, he briefly pursued General John B. Hood’s Confederate army through northwest Georgia. Sherman then turned his army south toward Georgia’s largest city...Savannah. His now legendary “March to the Sea” ripped the heart out of the Confederacy, demoralized civilians, destroyed railroads, and denied Confederate authorities considerable food and other badly needed supplies. Sherman’s army totaled 62,000 of his best soldiers, including 5,000 cavalry and 65 pieces of artillery. He estimated to reach Savannah would require six weeks, yet Sherman ordered only enough food for 20 days, to be carried by 2,500 wagons. Sherman’s plan was a dangerous gamble, because his army was cut off from any communication or chance for re-supply. So his troops foraged “liberally,” living mostly off the food they took from civilians. The worst foragers were labeled “bummers,” often stealing or destroying property indiscriminately. Leaving Atlanta on November 15 and 16, 1864, the army split into two “wings” of between 28,000 and 29,000 each, with cavalry guarding their flanks. Marching along generally parallel routes, the two wings were often separated by between 20 and 40 miles. Separation avoided congestion, thus the army advanced quickly, and was allowed a larger area from which to forage. Separation also resulted in a broader swath of devastation across the center of Georgia, measuring up to 60 miles wide, and 300 miles long. Thousands of slaves followed, which the army discouraged, knowing they could neither feed them nor guarantee their safety. Sherman’s two wings confused the Confederates. Major General Oliver O. Howard’s “Right Wing” advanced south to threaten Macon. Meanwhile, Major General Henry W. Slocum’s “Left Wing” feigned toward Augusta. Confederates split their paltry forces between the two cities, but Sherman ignored both. He concentrated much of his army around Milledgeville, Georgia’s capital city, then swept on toward Millen and Savannah, besieging the latter on December 10. After ten days the 10,000-man Confederate garrison, under Lieutenant General William J. Hardee, evacuated the vital seaport. Sherman wired President Abraham Lincoln afterwards saying, “I beg to present to you the City of Savannah” as a Christmas present. Cavalry clashed frequently along the edges of Sherman’s march routes, and two sizable infantry battles occurred. On November 22, 1864, Georgia militia, untrained boys and old men, were slaughtered attacking Federal lines at Griswoldville near Macon. 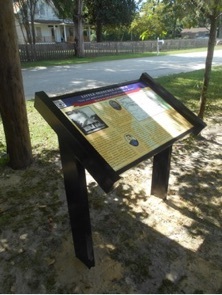 And on December 13, Sherman’s veterans overran Fort McAllister along the Ogeechee River, enabling the U.S. Navy to re-supply his army. Sherman accomplished all his goals for his March to the Sea in only five weeks, inflicting one billion dollars worth of damages. “I can make Georgia howl,” Sherman had sworn, and he did.